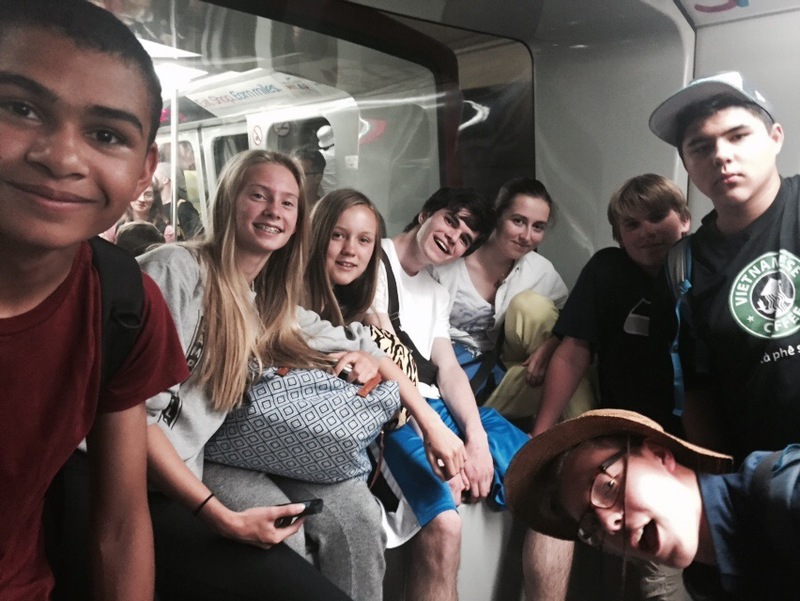 Epiphany’s Youth Pilgrimage to the Holy Land is complete and all ten of us are back safely in Seattle. The short report is that it was a wonderful trip. We traveled far and walked even farther. We visited Christian, Muslim, and Jewish holy sites. We swam in the Dead Sea and the Sea of Galilee. We explored two thousand year old ruins. And, we experienced the beauty of this place during the Summer Solstice and the month of Ramadan. This trip was truly a highlight in my adult life. The chance to see and experience the Holy Land was formative and exciting. I am thrilled to bring back to Seattle a sense of geography, of distance, of smell, and of taste to share with our children in my role as Children’s Ministry Convener. But, the thing that I will remember most, and that I feel the deepest gratitude for, is the opportunity that I had to share the experience with Tieran, Sam, Alex, Winston, Nick, Jeannine, Ginny, and Maria. Each of them is flexible, intelligent, kind, inquisitive, and thoughtful. My most poignant moment of our trip was standing with our group on a busy corner in Bethlehem. The wall built to delineate the West Bank towered over us, and brambles and trash surrounded our feet. The noise around us was of thousands of Muslim faithful walking in pilgrimage to the Dome of the Rock to pray. We listened to the Gospel and to a poem by Robert Frost. 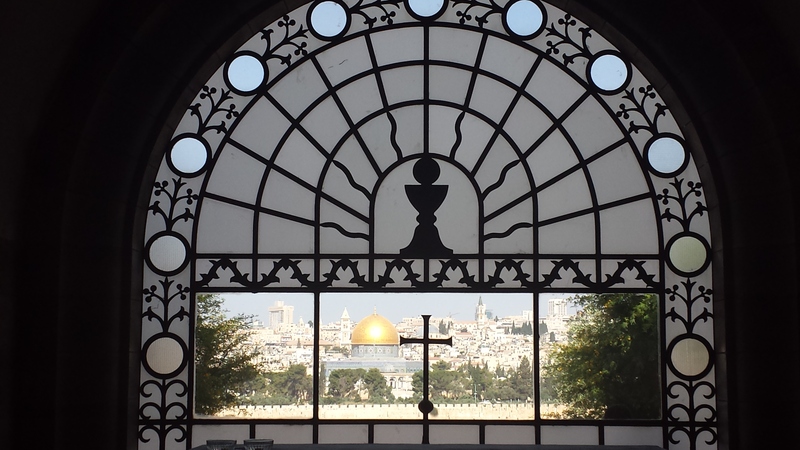 In that moment, I was stuck by the magnitude of the challenge facing the Holy Land and the world. And, yet, I felt a great sense of comfort knowing that this group of young adults is being formed to respond to these challenges. We are in good hands. We pilgrims will share a presentation about our trip at a +TEC Forum on September 20. Until then, please engage us for individual conversations about our travels. 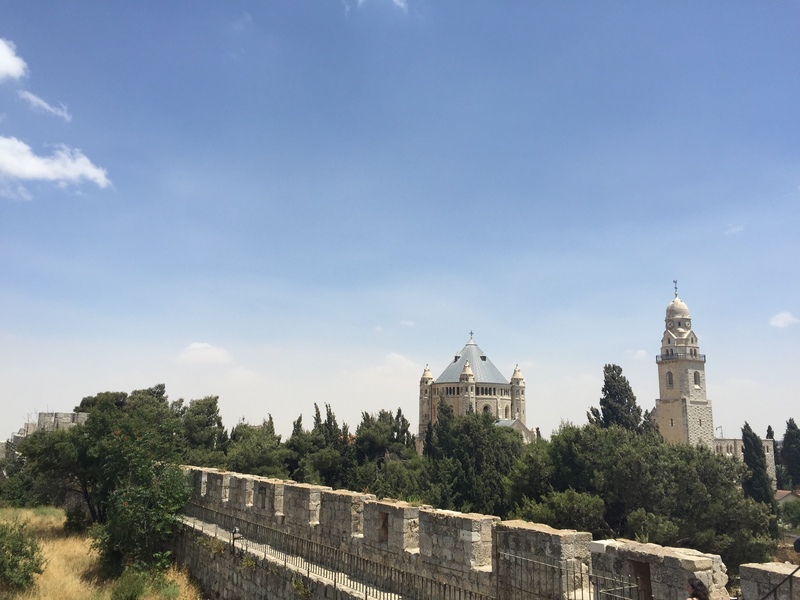 We can share stories of lost luggage and created friendship, details regarding the intricacies of “modest” dress in the Holy Land, discussions around the politics of the region, and much more. Finally, on behalf of the whole group, I thank Laura Sargent and the Epiphany Staff for the immense work that they did to make our trip smooth. And, I thank you, our Epiphany Family, for your generosity and prayer before and during our travels. Thank you, Shukran and Toda. It’s hard to believe that this trip is wrapping up. We have been all over the Land of the Holy One, and now as we zoom in and focus on Jerusalem, we enter the last days of our trip. Today started with a respite late morning (8ish rather than 7ish), which, as we have fully adjusted to Israeli time, was especially nice. After breakfast we walked over to the Cathedral of Saint George for church. I was looking forward to it because, while it would be a typical Anglican service, much of it would be in Arabic. I remember during my confirmation class, in the Anglican Communion lecture by Doyt, he mentioned that one could walk into an Anglican church anywhere in the world and pretty much understand what was going on. I was surprised how true that was. All the hymns were sung in both English and Arabic, while the first reading was in Arabic and the gospel was in English. The sermon was a bit long because the Dean gave the sermon first in Arabic, and then in English. The Eucharistic prayer was my favorite part because it was entirely in Arabic, even though many people were responding in English; (we got to sing the Sanctus and the Lord’s prayer in Arabic as well). After church ended, the people there moved to the courtyard of the guesthouse for coffee hour. After a quick break, Mark raced us off to lunch in the Catholic guesthouse. Even though I was disappointed by the lack of pita bread and various dips, which have typified most of our lunches, the meal we had was delicious. The sandwich was composed of fried goat cheese, pesto, arugula, tomatoes, and French bread. After lunch, we made the quick walk across the street to the New Gate (only 200 years old) and down the western wall of the city to the Jaffa gate. Interestingly, at this point, there is a massive gap in the world because somebody’s (Kaiser Wilhelm) carriage would not fit through the gate. From Jaffa gate, we walked up on top of the wall and all along it southwestern side. That part of the wall starts in the Armenian quarter, surrounds that quarter on 2 sides and then continues around the Jewish quarter. We passed various small buildings, a large grape vine, and the Armenian cathedral, the Church of Saint James (Jesus’ brother). We continued on the gate around to the Western Wall and got down in the Jewish Quarter. From the wall, we walked to the Jerusalem Museum, an Israeli museum dedicated to the archeological sites on the western side of the temple mount. One thing that caught me eye in the museum was the introductory video. In the video, an Israeli man talks about the greatness, glory, and drama of the Temple Mount when the Second Temple occupied it. He then makes the assertion that all has fallen quiet and empty on the Temple Mount, in the mean time the bustling Dome of the Rock towers behind him. Beyond that irony, the archeological site was very interesting, two highlights were the remains of Robinson’s arch (all that remains is a small lip of stone, extending a few feet out from the retaining wall, which Mark demonstrated with a lip trick), the other highlight were the poor people’s steps that ran up to the temple. It is very likely that these were the steps the Mary, Joseph, and the baby Jesus came up when he was presented in the Temple. From that museum, Mark led us through the Jewish quarter (much more organized, neat and built up than East Jerusalem.) We meandered down the pathway and back into the Christian and then Muslim Quarters. Just after getting onto the Upper Cardo, we found a t-shirt shop. Maria and I had been looking for those t-shirts for Margaret and us. Finally, we found a shop than had the prints and would press the design onto a t-shirt (idea for twin day in homecoming week at Seattle Prep). We got three t-shirts and continued to make our way down the upper Cardo. Eventually, we returned to Saint George’s for a delicious dinner of lamb and chicken kebabs (expertly prepared by the chef Shadi). Now, as night falls, we head to bed early-ish as we are waking up at 5:15 AM for the Stations of the Cross and a trip to Emmaus. This has been an incredible trip and I am so thankful for the opportunity to come here. Peace! Be Still! And as Jesus said this, the winds ceased their roaring and all was still. Jesus then asked why the disciples were afraid, why they had little faith. And so in the disciples moment of fear, Jesus says Peace! Be Still! Jesus not only calls the winds to stop, but he calls the disciples to be peaceful and to be still. Jesus calls the disciples, he calls us to release our anxiety about earthly things and focus on the serenity of God and of Jesus. Letting go of anxiety is something that the disciples struggle with, it’s something I struggle with, and I think that it is something that a lot of people struggle with. I wish it were not true but there are times when I can easily get worked up by my anxiety. Be it flying, taking a test, or presenting a project, I will focus too much on those things and not on the other, important things in my life. While those things are not in themselves bad, traveling is a wonderful learning experience, and those tests and projects probably help me be abetter student, they can get in the way of the spiritual things in life, the things that have primacy in the kingdom of God. A good example of this for me is the 3rd and 4th weeks in January. At Seattle Prep, my school, that is finals time. Everyone, including me, is incredibly busy. I find that I tend to form sort of like a personal hurricane, pushing away anything that does not really matter for finals. This might be ignoring a friend who wants to engage more than a passing hello, or not connecting with someone who tends a person to talk to. The winds of the world build up so strongly around me that I very near completely ignore everything else. Everyone has winds in their lives, things that prevent them from connecting with the world spiritually, the disciples certainly did: in this passage, their winds were literal winds, but winds can be many other things. The winds in our lives keep us from truly connecting with the world, from being in the world as Jesus was. Jesus calls us to live in solidarity with the whole world, to love one another as Jesus loves them. He calls for the deconstructing of unjust social systems, and for the elimination of status and our world’s obsession with it. As Christians, we are called to follow in Jesus’ footsteps and change the world so it better reflects Jesus’ vision of the world, a vision of abounding love love and complete equity. The winds of the world are the things that distract us from having love overflowing, from living in solidarity. They distract us from engaging with a friend looking for more than a passing hello, with a friend needing someone to talk to, with a biosphere begging for healing, and with a world that needs so much love. And so in a way, as Christians, we are called to learn to moderate our winds. This is a tall order, I know, and one that I, and I believe we, will be working on for our entire lives. And now I turn to pilgrimage. Pilgrimage is about going somewhere else, being in a different place, but it is as much about leaving home, being away, and the introspection that being away encourages. I invite you this pilgrimage to think about ways in which the winds of the world prevent you from living in the world in a loving way: it could be an over-intense focus on schoolwork or career, the torrential flow of social media and news, or allowing one’s self to overly focus on status or privilege. And then, I encourage you to think how you can moderate the winds, and allow yourself to live as one in solidarity and unity with the world, to live as Jesus lived, in this place, thousands of years ago. Amen. Today, the Youth Group woke up at an unusually reasonable time and ate breakfast together before setting of for the day to go on the Palm Sunday walk, visit multiple churches and go up Mt. Temptation and swim in the Dead Sea (See post by Alex Wang). First, the Palm Sunday walk began on the Mt. of Olives in Bethphage and traveled down the hill into the Kidron Valley. Traditionally, on Palm Sunday large masses of people would actually walk this distance, singing and praising Jesus’ journey into the heart of Jerusalem, however we took the easy way out and switched between bussing with Omar (whom we love) and walking short ways. On the way down, we stopped at Dominus Flavit, where the church now stands in place of the historical event where the Lord wept for Jerusalem and its misunderstanding of his intentions. This site gave us a beautiful view of the Dome of the Rock, which we had visited a couple days earlier. Soon after, we left the church and continued down the mountain, slipping and sliding down its steep slopes and dodging the cars that drove through the small streets. 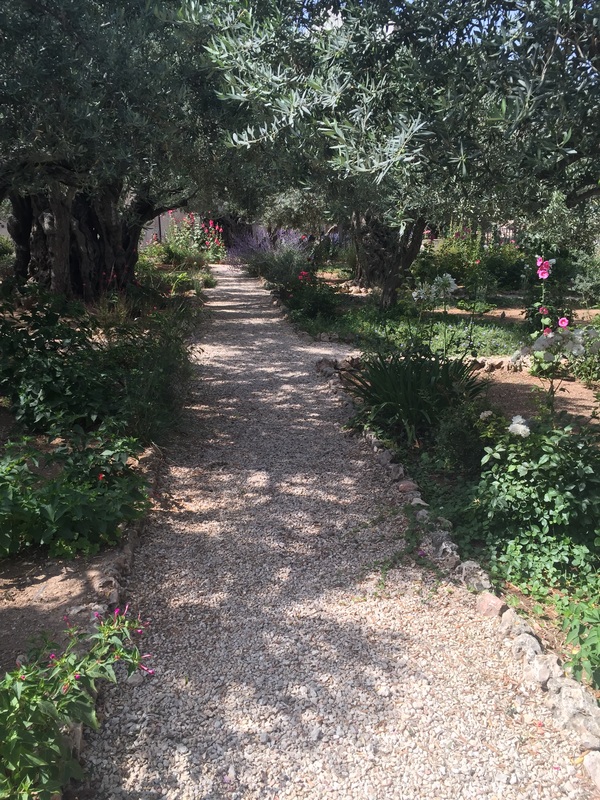 Finally, at the bottom of the mountain, we stopped at the Garden of Gethsemane where Jesus went to pray after the Last Supper, knowing that Judas would eventually turn him in. 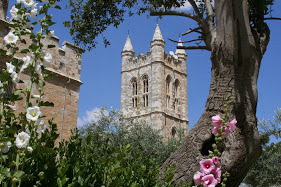 The Garden held many beautiful flowers and old olive trees as well as a church that housed murals depicting the scene of Jesus’ capture. At the bottom of the hill, we met Omar our bus driver and he took us to Caiaphas Palace, out on our way to the lunch and the Dead Sea, both of which we were greatly looking forward to. Caiaphas Palace, known today as St. Peter in Gallicantu or “crowing rooster,” was the alleged location where Jesus was brought after being captured in the Garden of Gethsemane. He was then placed here in Caiaphas Palace in a dungeon where Byzantine (4th/5th century) torture devices had been found. We looked around and went deep into the basement of the church there and explored the caves that may have once held Jesus captive. After visiting the palace, we headed off for Jericho and the much sought after lunch that made our stomachs rumble in the intense heat of the desert. We took our time eating lunch then stopped at a “cousin” of our guide Iyad’s store, where hopefully your pilgrim may have bought you a glass blown chalice or maybe even a body scrub from the Dead Sea (Keep your fingers crossed!). Now by this time, the heat had taken a toll on all of us and the only thing we could daydream of was taking that refreshing swim (or rather a float) in the Dead Sea. And you can read that extent of todays journey in Alex Wang’s blog post. 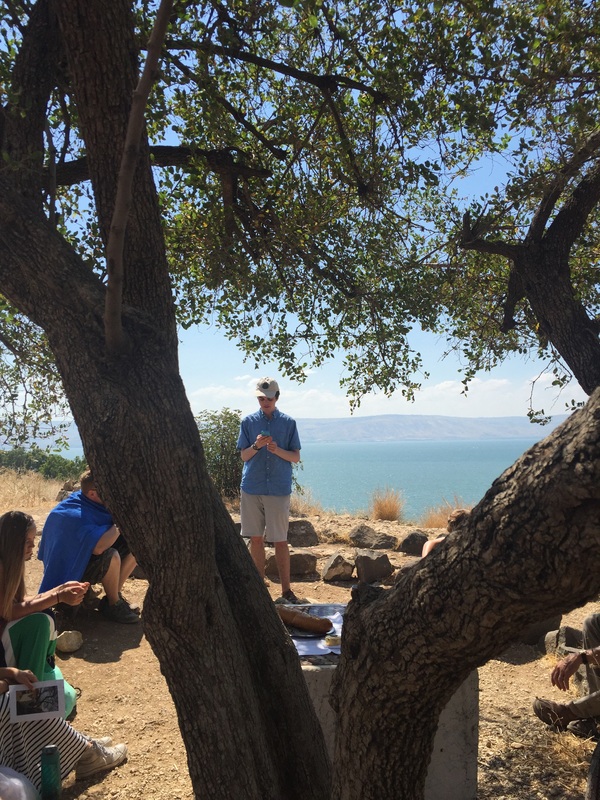 Stay tuned and keep reading for the last few days of our Pilgrimage here in Israel! After visiting the monastery on the Mount of Temptation, we headed to the Dead Sea for a swim. While we had all been told of the Dead Sea’s strange properties, I don’t think a single person amongst us was really prepared for what awaited us. True to the tales, the water was much thicker and, as a result, you were able to float surreally well which gave the effect of near weightlessness. However what we (or maybe just me) weren’t told until we were almost there, was that the fabled extreme salt content of the water would burn any exposed cuts or mucus membranes (eyes, inner nose, etc.). As I got into the water I experienced just how much salt can make a wound hurt, because a rash and mosquito bite on my arm began to feel like they were being assaulted by fire ants (or at least what I imagine being assaulted by fire ants would feel like…). To make matters worse, I got some of the water splashed in my eyes and spent several minutes stumbling about with my eyes screwed shut in pain. I finally emerged from the sea and found the ground to be scorching hot and had to make a quick dash to the showers in order to keep my feet from literally burning. While I may be painting this scene as one of discomfort and dissatisfaction, I actually found it to be a profoundly interesting experience, just one that I wouldn’t want to repeat. The morning for the Seattle Pilgrims started off warm, comfortable, and peaceful. After several minutes of lounging, eating, and sipping on hot drinks, Mark suddenly rushed in, informing the group that we all had to hurry out to the bus. The day being Friday, a very important prayer day, many people flooded the streets, hurrying to make it through the multiple checkpoints and crowded roads. One of the girls, Maria, ran-waddled out to the bus holding her shoes, scarf, a change of clothes, bag, and water bottle, all of which spilling out of her arms. This act caused multiple people to laugh, and they were all soon aboard the bus, excited for the events to come. Eventually, after a while of driving, the bus arrived at Herodium. The group filed out of the bus and meandered over to the small gift shop/viewing room. We all took turns taking pictures of the model before gathering in a small side room to watch a mini-movie on the history of Herodium and the death of King Herod. The entire group voted to hike all the way up to Herod’s palace, and started up the hill. The day overall had been slightly overcast, though still warm, keeping the sun from leaving its mark on the shoulders and backs of the group, which made the walk moderately nicer. The view seemed to stretch forever, overlooking the Judean Desert, the mountains of Mohab to the east, and the Judean hills to the west. Being able to see the homes, old ruins, and rolling hills filled the group with an indescribable feeling that is only gained when looking across land that has seen and been a part of so much history. We walked up a little more before stopping to look at what had once been King Herod’s personal theatre, a show of extreme wealth. A couple staircases later, the group arrived at a 1:7 model of what Herod’s tomb had looked like at one time. The base of the original construct was barely a foot from the model, and demonstrated the amazing extravagance of a very wealthy man. We then started up a different path, the teens breaking off from the adults, and soon came across a staircase carved into stone, each step roughly a foot tall. We all paused a second before bounding up each and every set of stairs. Finally, We walked out of the cave. Huge stones created a large circular wall, holding many pillars and remains of old rooms, such as a bathhouse, weapons foundry, and a huge pillar room for meetings and/or meals. We eventually came down off the hill, bought a few items from the gift shop, and climbed back into the bus awaiting the next adventure. This adventure happened to be visiting an amazing shop where our group overall left behind quite a lot of money; a very good thing, as the wall had long-since cut off the main road of tourism for the area. After quite a while of browsing through wooden carvings and amazing deals on jewelry, we paid for our new belongings and left for lunch. We were not able to drive all the way, so partway there, Omar was forced to let us off to walk a bit before picking us up again. We pilgrims then left, walking to where our bus would be waiting for us. This meant walking along the separation wall. Seeing concrete splitting people apart from who used to be their neighbors brought the pilgrims sadness, yet the artwork decorating the rough concrete gave us both hope as well as an admiration for those making a life inside those walls. We paused to pray before continuing on to lunch. Every single member of the group hugely enjoyed the meal of falafels, pork, pita bread, and multiple fresh salads/dips. After paying, we crossed the street and followed an unusually empty pathway to a nice little bench area next to more ruins in what is called the Shepherd’s Field. Jeannine read a passage from the Bible, before the group walked over to take pictures of a cave displaying an example of (thought somewhat larger) the place where Jesus had been born. We pilgrims then made our way up to the small but powerful nearby church, listening to the other group talking and singing in Spanish before leaving the space to us. Nick read a passage from the Bible before the entire group participated in singing Christmas carols. The sound carried around the room, enveloping us in the sound of their singing, before slowly dying off. The group was talked into spending even more money by some friendly street venders. When we finally decided we were free, we spotted a store with ice cream out front and couldn’t resist. 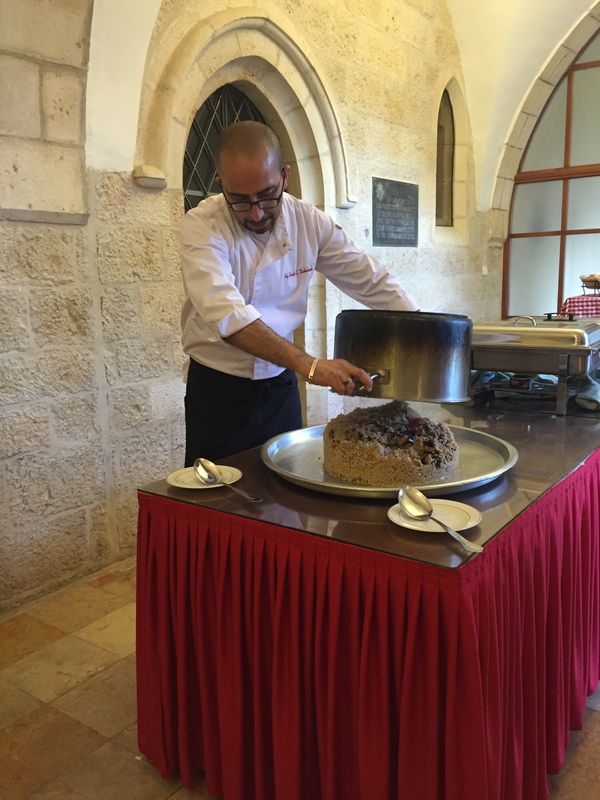 By the time everyone finished with our snacks, Omar had returned from his special Friday prayers, and the group once again boarded the bus and soon arrived at the Church of the Nativity. Though normally very crowded, the group waited in a moderately short line, giving us time to admire the brilliant artwork in the room. 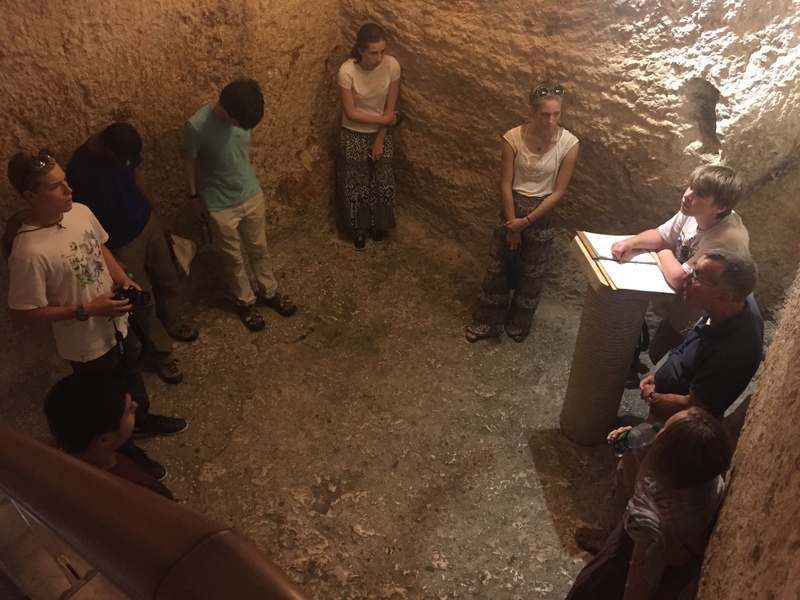 We eventually entered the small room before taking turns to kneel down and pray, touching the rock marking the pace that is believed to be the birthplace of Jesus. Yet another powerful moment was witnessed as a baby was brought in and blessed above the stone. After taking several more pictures, the group exited the small cave before climbing up a staircase to marvel at the chapel. After that, we all got on the bus, and quite a while later Omar brought the bus as close as he could to the hotel, dropping us off to walk a few blocks back to our rooms. Just an hour later, several of us left the hotel again to explore the stores along the American Colony Hotel. A few hours later, everyone sat down for dinner. This consisted of an amazing dish named “maqloubeh,” (a traditional rice, meat and vegetable dish served “upside down”) and salads, and a special desert. After a quick meeting and prayer, we all retired to bed, thinking back on the amazing events of the day.